2012 is coming to an end and we've had quite a year of kizomba in Seattle. We went from having a dance once a month to 3 additional venues: Limelight on Monday (rotating with salsa and bachata), Tuesday night practice, Bachata Dance on Wednesdays and Last Friday at Waid's. Kizomba is also being played at other dance socials to change up the pace: at the Century Ballroom on some salsa nights, at the Salsa Con Todo Social on Friday nights. Kizomba class series continue to be hosted by the Century Ballroom. Classes offered; Kizomba 1, Kizomba 2 and Kizomba Lab. Kizomba was featured in the Seattle Salsa Congress this past Thanksgiving and there was great turnout and support for the dance. Seattle hosted some great kizomba instructors who helped us to learn and grow: Joao Rocha, Mafalda Amado, Oscar BA, Eddy Vents, Sara Lopez, Albit Rojas and last (though certainly not least) Kwenda Lima. Happy Holidays and see you out dancing! I am neither Argentinian or from a PALOP nation. I grew up in the Philippines, am Chinese by descent. I've been studying Kizomba for 3 + years and have been teaching it for 2 years now. I have studied Tango on and off over the last 10 years but would consider myself only a year older in Tango years as I am in Kizomba years. Kizomba was first described to me as an African Tango with the feel of blues and bachata. I understand why this description was made - most of the people that introduced the dance to me know those dances and in that context, I can see why the description is accurate. This comparison between tango and kizomba is inevitable as both dances are danced in such close embrace. Tango as a dance has been around much longer than kizomba. Experts on each side passionately declare with certainty "this is Kizomba" or "this is Tango". However, when the question is asked, "Why is this tango and not kizomba? ", aside from the obvious differences in the music and the dances' origins, the answers are not enough for me to understand the difference. Simply watching videos is not enough to explain it. I need someone to be able to concretely say: “there, that move, that’s not in the spirit of kizomba because….”. Though I have never thought the two dances the same, articulating the differences is difficult because the response always came down to "the feel is totally different'. That statement is simply not enough for me. When you listen to tango and kizomba music, the difference is as clear as day. Since the dance is an expression of the music, it stands to reason that the movement will differ as well. This post is my attempt at articulating the differences in the movements of these two dances. Often times the same words will be used by teachers in both dances but the execution and interpretation are not the same. When I learn a dance, I need information to feed both my analytic and visceral minds. I can follow by seeing but that is not enough. I can also mimic through feeling. I need both these aspects to learn the movement. I need to also be able to articulate how the movement is done: what drives it as well as the spirit or intention behind the movement. This is ability to differentiate is important for me as a dancer because I know how easy it is to misinterpret movement just by looking. To someone that’s learning, a hip circle and a knee circle might actually look the same but its not. When you ask a classroom full of people to "take a step", the end result is not uniform. This post my attempt to articulate my observations of the similarities and differences between Kizomba and Tango. Both these dances are danced in close embrace. In Tango, there are varying degrees of closeness. In Kizomba, the embrace is like a hug (you know what I mean if you've danced it). There are varying degrees of closeness in kizomba as well but the kizomba embrace is more intimate because it conveys the comfort of a hug. The tango embrace feels more formal, as if you were embracing an acquaintance, not a dear friend. Both dances are characterized as walking dances and require a closeness in connection so that when one watches the partners dance, it is as if lead and follow are moving as one. Both dances have steps that have the following tempos: slow (more than 2 beats), quick (taking 1 beat), syncopation or shuffle or cha-cha (taking 1/2 a beat). Both dances are fluid and when the connection is not present, there is a resistance in the movement, as if I were dragging or fighting instead of going with the flow. Here's an obvious one: Tango has a line of dance and kizomba does not. In Tango, one's steps propel forward with purpose, gliding across the floor. The movement is driven from the body's center - that midsection between the chest and the hips. Tango walks travel down the line of dance and most of the time, the follow is walking backwards. In kizomba, one's steps undulate from the floor. The feet never leave the floor and movement from the ground travels up through the legs and the body in a wave. Its like walking through sand. The walk is meandering, as if in slow motion, not having to travel a line. The moves tend to be circular instead of back and forth in a linear fashion. This is tango terminology. In the context of walking, parallel system (or I think of this as mirroring) means that the leads feet when stepping, mirror the follows feet. When the lead takes a step forward with their left, the follow is stepping back with their right. In contrast, the cross (or I think of it this as stepping with the same foot) system means that when the lead takes a step with their left foot, the follow is also stepping with their left foot. This distinction of systems of walking is not made in kizomba. In kizomba, leads and follows will be facing each other and their walk is mirrored, which when using tango terms, would correspond to the parallel system. As far as I know, there is no such thing as a cross system (in the tango context) when dancing kizomba. Can the follow and lead step on the same foot in kizomba? Yes, but this starts to happen in the more "advanced" movements where people that have already mastered the foundations start to "break the rules". Except for leads that apply their tango expertise to kizomba, the cross system in kizomba is more of a playful accent and is not really used when travelling or walking together. When pausing in tango, there is a pronounced stillness that is accented by what I would call foot play with the floor or your partner's leg. I see the leads and follows drawing small circles with their feet on the floor. I see tapping with the top of the foot or heel. In kizomba, there is really no moment of stillness. Instead, what happens is that the undulation from the floor slows down or the undulation translates to the body in waves and circles. Kizomba also has a pause that is punctuated by the foot pressing down on the ground without transferring weight or traveling. The tango embrace feels more formal than the kizomba embrace. There is more body contact in the kizomba embrace than there is in a tango embrace. The connection between partners is probably one of the closest connections in the world of social partner dancing. The close embrace in kizomba has more physical touch point between partners. There is chest contact and leg contact as dancers walk: the inside of the follow's left leg has contact with the outside of the lead's right leg and vice versa. There are no gancho/boleo/volcado moves in kizomba. These are all things that dancers with tango influence have added to kizomba. Tango is more upright while kizomba is wavy and has a pulse that can be felt through the body like a wave from the floor. There is very little hip movement during the walk in tango where as in kizomba, there is a backward roll of the hips. Ladies can also provide additional accents to the dance by using their hips to move in circles or small square. Kizomba, compared to tango, allows for more body movement which in turn 'softens' the dance. In Tango, as one steps, their posture is "zipped up" from the navel up through the chest and one's foot "digs in" to the ground and then twist up around the spine and/or propels forward. The movements are smooth but have more edginess to them. The twisting of the torso also provides the energy to move and disassociate the upper body to keep that chest to chest connection with your partner during the dance. In kizomba, this twist around the spine does not usually happen. As one takes a step in kizomba, the feet do not leave the floor and the knees bend, as if sinking into sand. As the weight changes from one leg to the other, there is continual movement through the leg as the knees bend and straighten (never locking) to move. Step patterns in kizomba are very similar to the step patterns in milonga: the differences are in how the steps are made and the similarity is in the rhythm and the cadence of the steps. When I dance tango, it feels like gliding on ice, with the feet "caressing the floor". There is a gathering of energy and then push and slide to get from one point to the next. There is also the occasional twist and pivot , that creates an illusion of stillness this effect of stillness followed by a burst of energy - much like when you tighten the coils in a spring and then release to twirl. The dance is precise but allows for moments of stillness and playfulness as the music runs its course. When I dance kizomba, I feel like I'm in one long hug, walking in gooo, trying to pick up my feet but being unable to do so. The music has a pulse like a heartbeat and in that relaxed and secure embrace, I move with my partner. Our movements fill up even the spaces between the pulse in the song and we are in no particular hurry to get anywhere, just chilling out and enjoying the music together. Kizomba at its best, is a dance where I can relax into my partners embrace, feel the music through his lead and simply dance. Our last big event with Kwenda Lima in Seattle was a huge success! Thanks for much for everyone's support and participation! Its impossible to write down everything that we shared that weekend. Its safe to say though, that it made a big impact. I'm glad I took a chance to reach out and bring Kwenda here to Seattle. Its been almost a month since then and in that time our wonderful summer has switched off and Seattle's grey fall/winter is now in full force. The biggest news is that Kizomba will be taught at the Seattle Salsa Congress this year and I will be teaching it! The congress will be offering a bachata/kizomba room and there will be a kizomba class in the evenings from 7-8pm Friday through Sunday. I can't tell you how excited I am to share kizomba in such a setting - how cool is that? Ana Antunes will be hosting her once a month kizomba series on November 19th. First Friday Dance on December 7th at East Hall is up next. Last Friday Social is still on but please check the Kizomba Seattle page for more details on that. I hope to see you out dancing In between holiday preps and celebrations! Kizomba has grown so much in Seattle this year and its a pleasure to be able to share that with one of Kizomba's premier artist and teacher: Kwenda Lima. 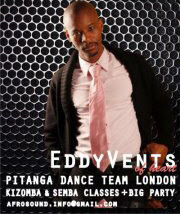 On October 13-14, 2012, he will be sharing his knowledge of kizomba and Kaizen. The weekend will have 7 hours of workshops and a Saturday dance. Join us as we make Kizomba Seattle history and see how dancing can set you free. 10-12-12: Registration is closed. We have room for leads and couples. Follows, if you plan to sign up by yourself, please be aware attendance is currently follow heavy, try to sign-up with a lead. Please email: kizombaseattle@gmail.com if you want to register and make sure to bring cash or check to pay on Saturday (or Sunday if you only plan to attend Sunday). Credit cards are accepted but there will be service fee. Kwenda Lima was born in Cape Verde, an island country west of Africa, with strong Portuguese influence. He is an accomplished dancer and choreographer. He has worked on various choreographic projects, and has more than 10 years of experience in teaching Kizomba and Cape Verde traditional dances. He is currently the most sought after Kizomba teacher in the world due to his amazing style and musicality. His project Kaizen dance, touches people heart and soul; and he also focus on African-Contemporary dance. His charisma and generosity in teaching is an inspiration for those who get a chance to learn from him. Currently, Kwenda lives in Lisbon, teaching in Kizomba Festivals, salsa weekends, and hope to bring Kizomba to other parts of the world. Check out Kizomba Seattle on facebook or Kizomba Seattle Blog for more about kizomba in Seattle (music, events, classes, etc.). Seattle we are in for a treat! Albir Rojas and Sara Lopez Martin will be visiting Aug. 3 5, 2012 to dance and share their love of kizomba with us. Friday Aug 3: Albir and Sara will be our guests for the 1st Friday Kizomba Dance at East Hall. There will be a beginner lesson from 9-10pm and then dancing from 10pm - 1am. $5 for the lesson and $10 for the dance. $15 will get you in for the lesson and the dance as well as a joint cover for the salsa going on at the main ballroom. **Invite only: Separate registration through Frances Tee via email CoachTee@gmail.com required. This class is an Advanced Level class. Sara and Albir are available to teach privates on Friday 8/3 before the social and Saturday 8/4 before the workshops. Please contact through email: coachtee@gmail.com to schedule or with questions. Pricing for the privates is still being confirmed and will be updated as soon as it is available. I am not a native kizomba dancer – I learned about the music and dance 3 years ago. It touched me in a way that other dances have not and I wanted to share that with others. My back ground in dance doesn’t have just one root. I grew up in the Philippines and learned folk dances. In my teens I danced ballet and jazz until I discovered partner dancing. Nowadays, I dance salsa (on1, mambo, casino), bachata, lindy (ever hear of swango? ), blues, basic ballroom, tango (still learning) and west coast swing (still learning). I’ve had other dance influences: belly dancing, African movement and a little bit of hip hop. I love bringing people together to accomplish something positive. I’m someone that isn’t always interested in history though I’m always curious to know how things came to be. I am a person who enjoys immersion in learning and doing different things at the same time. Some might argue that this might cause one to loose focus. For me, the variety energizes me and keeps me from putting blinders on. Learning helps me see new things and reminds me that there are always nuggets to uncover. This state of being also leads me down a path where I’m continually growing which is exciting in how limitless it can be. Kizomba has given me the chance to teach, learn, grow and enjoy music and dance even more than I already do. With Kizomba, I’m also on virgin ground. This dance is young in its own evolution and its even younger in its exposure here in Seattle and in the US. I’ve been lucky to know some key people that shared my enthusiasm and together, we’ve been able to sow some seeds and see some wonderful flowers sprout up! Well, now that We have this nice little garden, what to do? For me, Kizomba is a dance where the steps are simple and the challenge is how to dance it so smoothly with a partner to music. It’s a dance where I’m in a hug: one that feels warm and cozy. The music puts me at ease because its base beat feels like a pulse, a heartbeat. When I’m dancing, I can enjoy the closeness of the embrace with another person, while listening and moving together to that pulse. Every dance is different because I’m dancing with someone else who hears different things in the music than I do. The same song is a new dance when I dance it with a different person. The same song with a familiar dancer can be danced differently because we hear different things depending on how we feel and what we choose to express. It’s a dance that’s at its best when you relax, hold yourself up naturally and comfortably, listen and move. You don’t have to know how to spin on the spot. You don’t have to understand about how to create the right tensions with an anchor step. You don’t have to know what a channe turn is. You do have to be comfortable giving and receiving a warm hug. You have to know how to walk sometimes slowly, shuffle and move to the music you hear with your partner. All the extra body movement, all the fancy steps, leans and dips: that’s just like adding extra icing to a cake that already has the right ratio of icing to cake. I want to continue to teach it and share it with other people. I want to continue to grow as a dancer. I want there to be so many great dancers that every new person that learns about kizomba will feel welcome and happy to stay. I want to be part of a community that also shares in keeping kizomba thriving so that it is not just some passing fad but something that is here to stay. It would be great to have kizomba played in different venues: by itself all night long, alongside other music with similar feel or even as a way to wind down from an evening of energetic dancing (like after a night of salsa or swing). It would be awesome to see the dance floor fill up with dancers whenever a kizomba song came on. And while I’m thinking wishfully… wouldn’t it be awesome to have it as a featured dance on Dancing with the Stars?? Wouldn’t it be cool if some kizomba artist teams up with a popular US artist and a kizomba song became a top 20 on the US charts? Now let me ask you the same question: what are your thoughts on how kizomba should grow? Please feel free to post your ideas for an event, for a venue, for anything that you think would help this lovely garden take root all over If you’re shy of public commentary, feel free to email me directly using kizombaseattl@gmail.com. HAPPY DANCING!!! Don’t forget that Albir and Sara will be coming in a few weeks (Aug. 4-5) to share more kizomba with us! Weekly Tuesday Kiozmba Practica Starts June 4th! Breaking news! We now have enough interest to start a weekly practice night for Kizomba. Its been such a joy so see how kizomba has brought together a wonderful group of people. Our community is warm and generous. Everyone is excited to learn, share and most of all, dance! Its a gift to see how things have developed and continue to grow. Y'all ROCK!!! Please thank Jack Ramsdell for volunteering to kick start this weekly event and get things going and to the folks that are pioneers in starting and contributing to this weekly event. Another 1st for Kizomba in Seattle: 3 nights and 2 days of workshops with Oscar BA (an transplanted Kenyan who now lives in Washington DC). Spending time learning from him and getting to know him was such a treat! On top of that, our kizomba community is growing and getting better and new people are being brought into its warm embrace. It never ceases to amaze me how welcoming and open our community is and how much fun it can be to learn and dance even though one is sleep deprived through the whole weekend. My gratitude goes out to Oscar for sharing so much of his energy and expertise; watching him work with everyone and the adjustments he made to dancers as they danced was as enlightening as it was fun. It brought home to me how basic this dance is and yet so many facets to unveil. At its simplest, it is a dance, in a warm hug with two people dancing as one to music that has a pulse like a heartbeat. Since we each are individuals with our own voice, we express different things as we listen to the different strands in the music: every dance to the same song can be different, every dance with the same partner can have a different feel. When one truly embraces the simplicity of it, the beauty of the music shines right through the dancers with no extra effort required except to listen and move together. The aftermath of the weekend has left me wanting more and excited to share what I've learned. Summer is coming to Seattle and I know that there will be a pull to enjoy the long days when the sun chooses to come out. The next weekend event is in the first weekend in August with Century Ballroom bringing in Albir Rojas and Sara Lopez. After that, there Kwenda Lima will be coming to Seattle in October (oh yeah!). Make sure to join the Kizomba Seattle page on facebook to get updates classes, socials, music, video's pictures and soak in / share with the kizomba Seattle community. We had a wonderful time with Eddy in Seattle! Not only was it his first time in Seattle, it was his first time in the United States. Seattle weather even blessed us with some lovely days (and with some grey ones) to give him the full spectrum s what its like here. Eddy shared his knowledge and passion for the dance and its origins and in turn was welcomed with excitement and such wonderful energy that we're already planning for his next trip back. To the growing kizomba community in Seattle (and neighboring cities): thanks for supporting kizomba and welcoming Eddy with such open arms. We had the biggest turnout ever for the evening workshop as well as the social that followed. To Eddy (the man himself) who suggested the idea of coming to the US last year in Jamaica: Thanks so much for sharing your knowledge and energy with us - we look forward to having you back. I'm still absorbing everything that we learned: applying it and figuring out how to teach it. What's become very clear to me is how simple and complex this dance can be. The dance steps do not require the same technical precision as executing multiple spot turns in salsa but it does put to the test, one's ability to communicate as a lead and a follow. Its almost as if the simplicity of the steps are a must because the connection between the individuals that are dancing to the music is as different as people are different. To make "magic" one has to adapt and still move as one with one's dance partner. I'm excited for the next event coming May 18-20: Oscar BA will be here s don't forget to register and join us for another kizomba-filled weekend. I can't wait! In the meantime, happy dancing. Eddy Vents was born in Guinea-Bissau and grew up in Portugal. He's been dancing Kizomba for 15 years. In 2010 he started teaching Kizomba in London and all over England, as well as many congresses around the world, such as in France, Finland, Serbia, Croatia and Jamaica. He s the founder of the Pitanga Dance Group, a group formed with the intention of delivering traditional Kizomba through teaching and performance to spread Kizomba all over the world. Hope to see you and Have fun out dancing! I know its barely April but time flies! Check out the details for our May event with Oscar BA and take advantage of early bird pricing. Here's a youtube video of Oscar dancing. Hope you're having fun dancing! This time last year, I was so busy worrying about mambo performances, I barely had any bandwidth to keep up with kizomba. I survived the performance craziness (thank goodness) and took a little break. When I was recharged, I had a crazy thought that perhaps I could go to the source to learn more about kizomba. It turns out there are lots of congresses to go to... but I was congressed out: from January to March of 2011 I had already been to 5 congresses! I didn't really want another congress. I considered a week in Lisbon but that was just too pricey for me. Then, I found this trip to Jamaica: a salsa - kizomba vacation in Ocho Rios. Perfect! I did what research I could, and tried to enlist some fellow kizomba-crazy people to come with me and in June 2011, off we went. I got back to Seattle with a bit of a conundrum about how to expose more people to kizomba. Basically, there's classes, socials, spreading the music and demos. There were smaller successes with workshops but in order to get momentum, we had to teach a class series. I wasn't really sure my dance partner amd I were ready to teach a whole series - after all, we are both still learning. Getting the socials going were hard. There just wasn't enough people to pay for a place and one of the public venues ran out of business. Socials in people's homes are great but not scalable to the general public. I also wished for a DJ to help spread the music. I met a pretty amazing DJ on the Jamaica trip but he's based in London - it would've been tough to get him here for gigs once a week. I also needed to work with someone on a demo so we could show people what this dance was all about and hook them in! 2012 started off with a bang! Our small practice group (also bachata fans) went to Reno for a bachata festival. There was a Kizomba Jack and Jill on Friday night and guess what? Seattle represented in the Kizomba room! The group of contestants was small but we got validation that the work we had been doing every week was good AND we met others who had the kizomba bug AND gave the bug to other folks. Not only that, we met and learned from Oscar BA and he ended up coming to the Seattle for Flirt (Feb 2012) to teach kizomba. He's coming back to Seattle May for a weekend of workshops! Most recently, thanks to some key folks (see Spreading the Kizomba Love post), just this month a couple from Portugal came to teach us about kizomba and we had 40 people attending - see some pictures. That was simply fantastic. I am now on several regional kizomba pages (10 different ones!) on facebook and there are now 2 other socials that are starting to play kizomba music here in Seattle. When kizomba plays, there are more and more people dancing it and more people curious about it. The Kizomba Seattle facebook page now has 255 members compared to barely a hundred early last year. Not only that, there is now the 1st Zouk/Kizomba Congress scheduled for October in San Francisco and another Bachata/Kizomba congress in NY York in September. Kizomba coast to coast! I'm still working to grow my knowledge of the dance, to help other folks in the community grow and to help other people learn about the dance. I haven't been alone. Its been quite a journey and I know that there will be ups and downs along the way. I just wanted to take some time to reflect on how far things have come. Thank you - or rather Muito Obrigado ( I hope that's right). I am overwhelmed by this weekend's success! The workshops with Joao N Rocha and Mafalda Amador were so much fun. I had a blast meeting so many people who are excited about kizomba: a sensual and lovely connected dance from Angola. There was so much I learned: about the dance, about the people that love the dance, about what makes the connection between lead and follow so sweet. Carlos Cinta and Carla Poma who took a chance and brought Joao and Mafalda to the US to spread kizomba love. And ofcourse, to everyone who attended and supported this fun-filled weekend and played a part in growing the kizomba family here in Seattle (and beyond). You can see more pictures on the Kizomba Seattle page. Here is a picture from Saturday's workshops. Here is a picture from Sunday's workshops. It's almost here! I'm so excited. Mafalda Amado and João N. Rocha will be in Seattle in 2 days and starting Friday, we'll be dancing a LOT of Kizomba. You can check out the details on the facebook event or use the link on the right side of this page. I hope to see you all out dancing and if you can't make it this weekend, watch out for other opportunities coming soon! Hugs and have fun dancing! Welcome to the Kizomba Seattle web page. This site will feature the events and classes hosted by Kizomba Seattle. These events will also be on Facebook under the Kizomba Seattle group page. In addition I'll share articles and videos on the blog (which you should also be able to see on the fb page). This duplication will help reach out to folks that are not on facebook as well as provide another source of Kizomba information. Don't forget: if you're on facebook, join the Kizomba Seattle group.